You may see the title of this post and assume that I’m about to tell you a story about my 4-year-old. Sadly, you would be assuming wrong. Let’s talk a little about one of my biggest pet peeves as a crocheter. Do you already know where I’m going with this? The crochet community (and all handmade, from what I understand) has been abuzz recently with much talk, and even more confusion about what “copyright” encompasses in the world of handmade goods. I’m going to focus on crochet, because that’s what I’ve familiarized myself with. Some designers seem to be under the impression that if they write a pattern, it gives them license to determine how things are produced by that pattern, and furthermore, what may become of any items created using it. These designers are either blatantly making up their own ‘laws’, twisting the existing law to suit their purpose, or are simply unaware of the details covered in the actual law. I’m going to give them the benefit of the doubt, and assume it’s the latter. What I imagine some people are actually doing (see Sweet Brown .gif below ha!). In a nutshell — or read directly from the copyright law website here— the copyright ends with the written pattern. The end. Easy peasy, right? There is no “for personal use only”. There is no “You may sell after the purchase of a cottage license”. There is no “you may not sell any finished items”. There’s not even a legal “Please link back to my web address”. That is just a common courtesy (that we really all should follow. I mean, really, let’s give credit where it’s due). This is a pet peeve of mine because we’re all in this together. We all started somewhere. We’ve all taken the time to learn how to crochet the stitches, and read the patterns. I don’t understand where this sense of entitlement came from (MINE!! MINE!! MINE!!). This idea that someone else owns the rights to something I created, essentially from a piece of string, is outrageous. The crochet community is, for the most part, a very tightly knit (no pun intended) group. I guess there are always a few “bad apples”, as they say. As much as the authors don’t want you to sell anything made from their pattern, they have exactly ZERO right to tell you not to. As has been very thoroughly discussed in this thread, copyright does not extend to finished items. It covers the pattern only. Pattern authors can ASK people not to sell finished items, but in my opinion, that only hurts their business because, as I’ve said here, I will personally never buy a pattern that has a contingency. We’re all crocheters. We’re all fiber artists in our own rights. If we’ve gone through the process of learning how to follow a pattern and actually crochet the item, that finished item is ours to do with whatever we want. Not all of us crochet to sell, but a LOT of us do. I don’t understand WHY a person would go through the trouble of writing/formatting/listing a pattern to sell and expect no one to sell their work!? WHY?! Most of the time, it’s because they themselves are selling the finished items and want to try to control the amount of competition in the market. Well, too bad. Once you sell the pattern, it’s mine. Not to sell (the pattern), but the items I create with my hands and my hooks are mine, and I will sell them all day. If they don’t want people making their items to sell, they should *probably* not put the pattern out there. Like I said, it’s a pet peeve of mine. One that I feel very strongly about. I intend to post free patterns (of my own), links to free patterns that I love, and links to patterns that I love that are not free. I will NEVER try to tell you what you can and cannot do with items that come off of YOUR hooks. If it is made by you, it is yours. If you make it and love my pattern or my blog and you want to let people know where you got it, great, but I don’t “require” that of you — I get enough mothering in with my own children. I don’t have time to mother fellow crocheters. It would be cool to see some link love, not gonna lie, but it’s your choice. I will also NEVER link you to a pattern designer who puts these stipulations on their patterns. I don’t support selfishness, and I won’t propagate the misuse of “copyright” law. Seriously — Ain’t nobody got time for that. That being said, it’s isn’t ok to use someone else’s pictures as your own. I actually suggest you watermark your pictures to deter people from using them. It’s also not ok to use someone else’s blog content as your own (actually covered by copyright law), and you obviously cannot take a pattern (free OR paid for) and call it yours, or redistribute it without permission. Where do you stand on this topic? I’ve found there seem to be very few people who side with the “do not sell-ers”, but I’m open to hearing why you disagree with me if that’s the case. *Be forewarned, I’ll delete bullying comments (even if they’re in agreement with me), so be nice. I’m looking for lively conversation, not crafter-bashing. Thanks! *The above .gif is not my own creation. I borrowed it from a terrific .gif site I found, http://www.gifrific.com. I’d hate to infringe on copyright in the midst of my copyright post! Categories: Hot Topics | Tags: Art, Copyright, Craft, crochet, Knitting and Crochet, Law, Pattern, Pet peeve | Permalink. I read your comments with interest, as a knitter and crocheter who is self-employed and relies on my pattern designing to earn a living. All of my patterns are covered by copyright laws and I have put a link on my web pages where people can read fully what that copyright covers. This includes clauses that my work must be attributed to me, that it cannot be used for commercial purposes and that it cannot be altered, or built upon. Why do I do this? – because people have blatently stolen my work in the past and passed it off as their own including re-writing my patterns on their websites. I consider this to be theft. My patterns take me hours to design, tweak, knit up samples, write up the instructions, check, check and check again. Writing patterns is a skill that few people have. I sell my patterns for a only £1.50 to try and offset the time it takes to create them, or they are published in magazines, who have exclusivity to the patterns for a fixed period after which the copyright returns to me. I also offer patterns for free as I like to share too. I design for magazines and books and they consider copyright theft a very serious offence. It is recommended that designer are covered for copyright theft, so it’s clearly considered a very serious issue. I have to sign documents that clearly state that any designs are my own work. I consider myself an artist and the things I create belong to me – I’m not a selfish person in any way but my designs are mine – I created them and what I do with them is at my discretion. If I were a mixed media artist and designed a work of art, no-one would dare copy it as it would be so obvious. I don’t feel that it’s any different with knit and crochet designs. I would never steal anyone’s pattern or tweak it a little bit then say it’s mine. There are so many free patterns out there that stealing other peoples designs simply isn’t necessary. I know designers who have had their designs mass produced by huge companies and they’ve had to fight legal battles which are rather unpleasant. These companies make millions on the back of other peoples work, which is totally unacceptable. So that’s why I clearly state what can and cannot be done with my patterns. If people write and ask me if they can sell stuff – I usually say yes, but please don’t mass produce. As I said, I’m not a selfish person and I like to share too, so I often put free patterns on my websites. First of all, Congratulations on becoming such a successful designer! That is wonderful! I think, for the most part, if you write something on your pattern about what you intended it be used for when you wrote it, people will generally respect your wishes. However, I think you greatly reduce the amount of patterns you sell overall if you limit yourself only to people who are buying patterns for personal use. — That is a general “You”, not YOU specifically. I was hot about this yesterday because of an issue that was being discussed in an online forum where a blogger/designer posted a free pattern, a crocheter made the item for a friend who wanted to support her Etsy shop, so she listed them (her Etsy shop is not even, traditionally, a fiber based shop, she typically sells paper crafts). Then the blogger got angry, sent her a rude message demanding she remove her listing, and then edited her blog to state “for personal use”. Had it said “for personal use” from the beginning, I’m willing to bet there would have been no issue at all. I won’t go into great depths, as I think it’s clear where I stood on the matter haha, but that is where this post stemmed from. I’ll have to post a follow up on what I figure out regarding mass production and international copyright laws. I’m interested to see if there are differences. I agree with you – once I make the pattern, the garment is mine to do with what I will. it would be NICE if, when selling, I gave credit for the pattern’s author, but I am under no obligation to do so. Here’s another question, a branch on the same topic – how different does a pattern need to be in order to be a new pattern? Take a hat pattern, for instance – a regular old beanie. Cast on x number of stitches, go around so many inches, begin decreasing regularly. I if I have you cast on 88 instead of 80 stitches, and go half an inch longer, decrease one more round, is it a different pattern? Or what if I just change the yarn and needle size? It is very tricky, and as a result, I don’t tell anyone my particular hat pattern – I got it from an old book (but not so old as to be free of copyright) and I change the size as required for the yarn and the head I am working with. So often it is not even close to the number of stitches in the original, but all else is the same, and it looks like the one in the pattern. Is it ir isn’t it a new pattern? That gets into a kind of “slippery slope” in my opinion. This is how I feel about that — and this is only my personal view. If you are following a pattern that is not your original brainchild, it is not your pattern. I don’t care if you change ‘x’ amount of increases/decreases, hook size, gauge, row count, etc.. It’s not yours. I feel that if something is yours, you painstakingly put the effort (ALL OF THE EFFORT) into creating it from inside your brain. Not by tweaking an existing pattern that was painstakingly brought into existence from inside someone else’s brain. That being said, there are only “so many ways to skin a cat” as they say. There are going to be similar patterns always. Does that mean that So and So copied So and So and therefore is a thief? No. It means that So and So wanted to make (blank) item, used the basic knowledge that almost all crocheters possess, and brought the idea to fruition. It could end up being almost exactly the same pattern as So and So Other Crocheter’s pattern without having ever being viewed by the “new” designer because it’s an obvious design. Does that make sense or am I rambling? I think people just need to be respectful of one another and give credit where credit is due. If one designer writes a new pattern inspired by the pattern of another designer, they should say so. And the original designer should be respectful of the new designer’s right to expand upon ‘their’ idea. I see so much petty competition in the crochet/yarn community, and I find it all so unnecessary. Just be nice, and respect your fellow crafters. You can’t make up a pattern completely from scratch unless you also invent all your own crochet/knitting stitches and basically reinvent the craft. No matter what, if you’re making a sweater, there are only so many ways to start and build up that sweater. You *might as well* take the basic structural elements from another pattern and tweak them, because it’s faster than trying to reinvent the wheel. Unless you think collage artists aren’t artists, I guess. Thanks for such an interesting post. When I first started selling patterns, I thought it was common practice to say no finished items can be sold without permission (although I gave permission to every person who asked). I thought it was a good way to “keep tabs” on what was being sold, and also to prevent mass-production of things from my pattern. Now that I’ve put all those newbie fears aside and have read up a little more on the topic, I re-released my pattern and removed the restriction. I tend to be cautious and either stay away from patterns with these kinds of stipulations, OR modify them just enough to stay away from any legal hungry individuals. But I am totally with you on this subject!!!!! I would say, just steer clear of the contingency patterns. Modifying them into a “new” pattern can seem kind of shady too. There are so many patterns out there, it’s not really necessary to hassle with the possible backlash of pattern modification. Designers who submit their written work to a publishing company may be giving up an amount of rights according to their contract agreement, if they even have a contract. For example, All Free Crochet Prime Publishing LLC contacted me about some written instructions I have posted on my blog. I let them use them, however I was not paid anything. They have the pop up advertising all over their site and that is how the make their revenue. I am not earning any revenue from them and have given up rights to the pattern regarding how they distribute the pattern now and into the future. They aggregate work from crocheters who write patterns and then distribute them in their online pdf documents. If I came across their pdf document being used inappropriate, it is up to All Free Crochet to take action, not me. There is an amount of traffic that does come back to me from the use of my instructions, so I do feel it is a fair tradeoff. I’m glad to see you here Teresa! I know you are well versed in copyright and are familiar with the discussion yesterday. Do you know if the laws are any different regarding mass production of items made from a pattern? Jen – The site taberone talks about mass production. A pattern is a method of operation, not eligible for protection. The site says Simplicity and McCalls do not register their patterns. The patterns are shapes as well. I do have a different thought process if you are going to mass produce hundreds or thousands of items per day. Copyright is about money. If you want to use something that someone else did. Create a contract or agreement with them to protect yourself. This is an example of a producer protecting the interest of the documentary. I have a video from when I lived in Germany with some footage from one of the border crossings. There was a producer making a documentary and did pay a nice fee to use a clip from the video. This means I still own the rights to the video, however the producer of the video earns all the revenue from the mass production of his documentary. I couldn’t agree more. In fact, I have re-blogged this! I always buy the “free” patterns, the ones without the “do not sell finished items made from this pattern” just in case a friend or family member wants me to make something for them, not everybody likes to ask for free stuff, especially if it’s going to be a gift for someone else. I think you make an excellent point, I am new to crocheting and I have never sold anything I’ve made, but just recently I’ve been posting pictures of finished items on facebook. From that I’ve had a couple of friends ask if I could make one for them, usually hats. I can’t afford to just buy the yarn and give it away so, if it’s an easy/quick pattern I say I’ll do it if they buy the yarn. I believe that would be classed as selling. Just as you say, most people won’t ask you to make them for nothing. I agree with everything in the main post and will ensure I don’t buy or use patterns which state I can’t sell them on a (very) small scale. I always link back and give credit. I’m a glass artist primarily and I know now nice it is to see that, and I don’t even sell my glass. This excerpt is from here, http://www.tabberone.com/Trademarks/CopyrightLaw/Patterns.shtml. I refer to this site a lot for copyright info as they make is easier to understand and provide lots of references. A pattern is a procedure, process or method of operation, for making something. The specific instructions for making the item might, might, qualify for copyright registration but that copyright only would cover the written instructions, not the patterns or what was made from the patterns. It’s really interesting to read the comments. Whilst my patterns are for personal use I clearly state that this includes making as many as you like for family, friends and charity purposes, as I really want people to handmake gifts and raise money for good causes too, so hopefully if doesn’t put people off my buying my patterns :). I’ve had a couple of nasty experiences myself where individuals have accused me of copying their patterns (which I didn’t of course – I have no need to copy). But BOY were they nasty – very nasty. I had lots of sleepless nights over it and it really opened my eyes. I’ve seen my patterns sold by other people on ebay (without my permission) and some people have tried to pass my patterns off as their own (one lady even had one published in a magazine which I could not believe!!!). But I never ever send nasty emails. Just polite requests. It sounds like you take things very well 🙂 Probably if everyone handled things politely, there would be no need for the debate at all. I don’t get the starving artist theory in “personal use”, telling everyone they need to crochet for charity as a stipulation to your pattern. But they can’t use it to survive or feed their own family? So this statement is contributing to individual supression, people who need help their self and have their own struggles. Often I get people who can’t even afford to buy yarn. I would go to another site. I do agree if someone is going into business where they are creating hundreds of pieces per day, they should create an agreement with the designer for use of the pattern. I have a hard time viewing hand crochet, hand knitting as mass production. I know it takes me 1-2 hours to make 1 pair of baby booties with 3 ply yarn. Knitting on the other hand can be duplicated by machine so it will move along a bit faster when done by machine. What would count as mass production? There are 52 weeks in a year. For example, if you make 3 pair of slippers per day and sell them for $10 each, that is $30 per day. That will be $210 per week. Sounds good. Multiply that by 52 and you get $10,920 for the year. Sounds like a nice part time job. Now we have to pay taxes. 35% will go to federal taxes, which will be a tax burden of $3822. State taxes will depend on your state so I will use 6% from my state. The state tax burden will be $655. This has taken us down to $6443. This is before cost of yarn and shipping expenses. We could easily estimate supplies, gas, handling, fees and shipping at $1500. Take off that cost and we are left with $4943 for the year. This is why I have a hard time viewing handmade, fiber arts as mass production. That puts things in a wonderful perspective, Teresa. I know I could not, personally, “mass produce” anything. And you’d earn more in a sweat shop right? Very informative and well thought out comment. I apologise for being late to the party, but this has come up as a discussion in the UK today, because one person was selling dishcloths at a fete and was threatened with legal action. Wouldn’t you love that in court? The Crown vs. Mrs Green from up the street. I really appreciate this post! Copyright is really confusing here in the US, and I’m never really sure what the rules are. 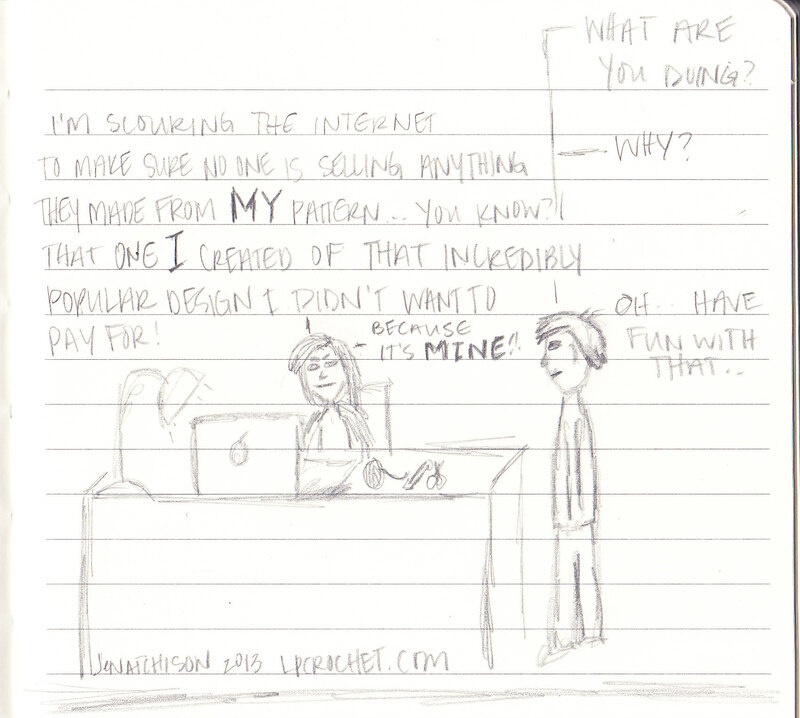 But this basically sums up my feelings on people using my patterns – sell away! I’m just happy that someone likes it enough to make it, and that someone else likes THAT enough to buy it. I might feel differently if, like, Urban Outfitters took my pattern and mass produced it without compensation or credit, which I’ve heard of happening a lot lately, but fellow crafters? No issues here. I’m happy to help clear things up for you! It can get a bit tricky. Great article Jen! For me we should follow the copyright law. I share my patterns for free and I don’t mind if they sell the finished product or copied my pattern. That is the risk you take when you share online. What I am doing will make others hate me. But they say the more they haters the more people will be curious to know you. If you are selling a pattern you don’t have control what your buyer want to do with your pattern after purchase. But if you use the pattern to mass produce you should give credits to the designer. If you quote from an author without giving them credit it is called plagiarism! It doesn’t matter if you purchase the book or not! I think this should apply to patterns purchased including those in books, or off the internet! I agree, Cathy – I guess I’m not completely understanding what Jei was saying (language barrier?). The written patterns are protected by copyright, and should absolutely not be distributed by anyone but the original pattern author. I agree with the Copyright Laws here in the US but what are they in the UK? That is where I have seen the most outrageous claims! It would be nice if we Americans knew the laws across the pond. 1- a designer retains ownership of their pattern and no one can copy it, claim it as their own and redistribute it. Common courtesy dictates one should give the designer credit and if the pattern is uploaded onto any site that does not belong to the designer, there should be a link-back to the original site. Reblogged this on Bagg Lady's Buzz. I “think” it says that objects made from patterns ARE subject to copyright laws. When I read the article from the above link (this is from Canada) you may create products from a fiber artist’s patterns as long as you make less than 50. (g) such other work or article as may be prescribed by regulation. Sorry for taking up so much space! So as much as I would love to have the law on my side to make and sell a few of the gorgeous crochet things for which I bought patterns for – it looks like as a Canadian that I can’t. I certainly am not going to make 50 of something to sell. I’m to ADD for that. lolz. Again – this is Canadian law I am quoting and not US. You guys are most likely different. Interesting. I wonder how, in the internet age, anyone is able to keep track of things legally. If I am in the US and you are in Canada, whose laws are in place if I purchase a pattern from you or vice-versa? Also, would it really be worth it for a designer to come after anyone (hand-crafter, not mass production company)? Legal battles are costly, and it just doesn’t seem worth it, financially. Not to mention, one would be hard pressed to prove that a crafter was using their pattern and not a similar one found elsewhere. I find it interesting, if not utterly confusing lol. You are subject to the laws of your country, AND the country that you’re in at the moment I believe. And rather than legal battles against individual, I think Shaming works better, at least in a community where people will know you or at least hear of you, and you want to maintain a good image. SO if you bought a Canadian pattern (or one actually registered as a design I guess cuz that’s when you get legal copyright) you would be subject to our laws. This was a great post. As a designer myself, I have never once tried to tell people not to sell items made from my pattern, because, as you so eloquently stated, what is the point otherwise? In one of my patterns, I do list a “suggested” starting price for those wanting to sell it. This is not anything I really even care about, but rather, the pattern is so incredibly extensive and time consuming, that without making it, a crocheter would most likely undersell themselves when it comes to the final product. It is exactly that…a suggestion. If you want to sell for less or more…it’s your call..your creation, and your time. (This is strongly stated next to the suggestion…I only do this for one pattern, btw – a pattern that I’m not even selling completed items from currently – and I definitely DO NOT try to find people selling these items to see what they are selling them for…honestly I don’t care). That being said, it frustrates me when designers try to say you can’t sell the finished items. I must admit that I’ve ignored that statement before (and now I don’t feel badly about it). I am a mere lover of crochet..its what keeps me sane and very much so happy. The last few months I have stopped fallowing some blogs due to the whole “mine mine”. Its taking the passion right out of the art of crochet. I do buy patterns and I dont and I will not have someone tell me I cant sell my made craft off a pattern I bought. I will always honor not doing anything with the pattern. just want to enjoy what great joy it bring to my life and my families. I personally have to agree here. I don’t think that any stipulations should be put on the products of patterns. I also agree with a commenter that stated there are very few patterns that aren’t similar or just like another. But modifying patterns is definitely a slippery slope that is best probably just stayed away from. Anyone have thoughts on this? I wonder how much modification has to happen before it can be considered “yours”? I like to do rounds “my way”, and so I change the stitch counts, etc so that it works for me. Same with how to start somthing “magic circle, chain start, etc. It also frustrates me when you see something that “looks simple” and buy the pattern hoping that they did something different to create shaping, etc. and nope – it really is just a bunch of grannies sewn together to make a sweater. >.< And then you "can't" sell anything you make from the pattern without permission (they say)….. when really I *could* have done that and was just hoping for *more* for my $2-7 pattern cost. Anyways – original question – how much has to change before it's yours to do with as you please guilt free? I quite agree with you. The finished piece should be yours to do with as you please. I’ve never sold anything I’ve made. I don’t make things with a view to selling them. However, if I made something and for example showed it to someone and they wanted to buy it then I would let them. Or if they wanted it in a different colour I would probably price up the yarn and add a little bit for my time. I think that is perfectly reasonable. I whole heartily agree with you. Here is the analogy I use; When you buy a sewing pattern, does it state on there that you cannot sell the finished item? No! So why do designers in the knitting and crochet community think that they can add this? First off, I think copyright law is far from clear on the subject of garment patterns. Vogue Knitting ran a Q&A article last summer regarding the subject (http://www.vogueknitting.com/magazine/article_archive/ask_a_lawyer_knitting_and_copyright.aspx), which essentially advised that prohibitions on the sale of pattern-produced items are probably unenforceable, but that it’s safest to respect the rules the designer has lain out. There’s anecdotal mention of someone who did get sued for selling items from someone else’s designs, but that’s admittedly difficult to trust without documentation. Bottom line for me, though, is that a work of fiction is substantially different from a crochet pattern, and if the law truly doesn’t distinguish between the two, we should fix the law. Secondly, I think it’s deeply unfair to malign designers who attempt to restrict usage of their patterns. I consider the act of buying or downloading a pattern like buying a movie on DVD– it was sold to me under the assumption that I’m watching it with my family, or maybe at most lending it to a friend. If I were to screen the film commercially (even if it took substantial effort and investment on my part– buying a projector, renting a theater, advertising, printing tickets, etc. ), that’s a whole different ball of wax. It’s not fair to make money off of someone else’s creative work without their permission, and it’s certainly not in the spirit of the yarncraft community. Ultimately, my feeling is this: if you want to make money from crocheting or knitting, write your own patterns. If you can’t, partner up with a designer looking for a crocheter– they are distinct skills and both are valuable. To do otherwise distorts the handcraft market– the price of each hat or scarf you want to sell needs to account for production time *as well as* design time, and no, the $3 you paid for the pattern does not count. I appreciate your non-jerky ability to disagree 😛 I can’t agree with the comparison of patterns to DVD’s though. The intent behind creating a pattern is to teach people how to make something for themselves. The intent behind producing a movie is entertainment. It’s never assumed that you will buy a DVD with the intention of making a profit off of it. It is ALWAYS assumed that if I am buying a pattern, I am planning to make it. It’s not really fair to say “if you want to make money, write your own patterns” There are plenty of crafters that have immense talent, but have no desire (or may lack the ability) to write their own patterns. They should still be able to make a profit if they have a target market. Also, the article you linked does not say that you cannot legally sell items made from these patterns, it says you can “probably” sell items made from them at craft fairs and be fine. I’m not suggesting that I should buy a $3 pattern and then mass produce and sell commercially. That’s not the same as buying said pattern and maybe selling 20 of that item at a craft show or on Etsy. I, personally, will not buy a pattern with that stipulation (even though I COULD sell), purely because I have no desire to get involved in that kind of argument. I stand by my earlier statements. I really feel that if you are that concerned about items made from your patterns, you (not YOU.. collective “you”) should not publish it. And you should certainly not SELL it, or at least be very clear about your desire to keep it for “personal” use only in the listing and not only at the bottom of the purchased pattern (which has happened to me). I’ve just started writing patterns and frankly, I give them away free. But I also put a line in there “You MAY sell anything you make using my pattern.” As somebody who doesn’t always have enough money to buy yarn, if someone can make something beautiful enough to sell from my pattern, then more power (and more yarn) to them!! If it’s an article of clothing, and doesn’t have any distinctive pictures on it, you can’t copyright clothing in the United States anyway. So any time you see a clothing pattern for crochet or knit (or anything else, really) that says “do not sell finished items”, you can freely ignore that. If the pattern includes a motif on the article of clothing, though–say, an original cartoon cat–that was created by the designer, that’s a bit more murky. If the pattern doesn’t say “don’t sell finished items” you are probably all right. If it says “don’t sell finished items” then where you might get in trouble is where you’re duplicating that original motif and selling that. The designer might have a court case in that instance. I say MIGHT, because if they didn’t spend the $35 to get the motif registered at the Copyright Office, the most they can expect to happen is the government might fine you. They won’t recover much else from you. And someone who is unfamiliar enough with copyright law to tell you not to sell sweaters from their sweater pattern is not going to be familiar enough to know you have to register before first infringement to be eligible for full damages. Just in case, leave off the motif except for personal use. I especially love the ones who come up for patterns based on licensed movies and TV shows, then try to tell you not to sell the finished items. I saw a pattern for a replica of a knitted hat seen in a famous movie that was like that. The hat wasn’t even central to the film plot but this person certainly didn’t design it, nor did she create the movie. A few of them warn you like that because they don’t want themselves or you to get in trouble over trademark issues but I don’t think that’s what was going on here. gamestop black frida… on Hey…That’s MINE! Alison Griffiths on Hey…That’s MINE!